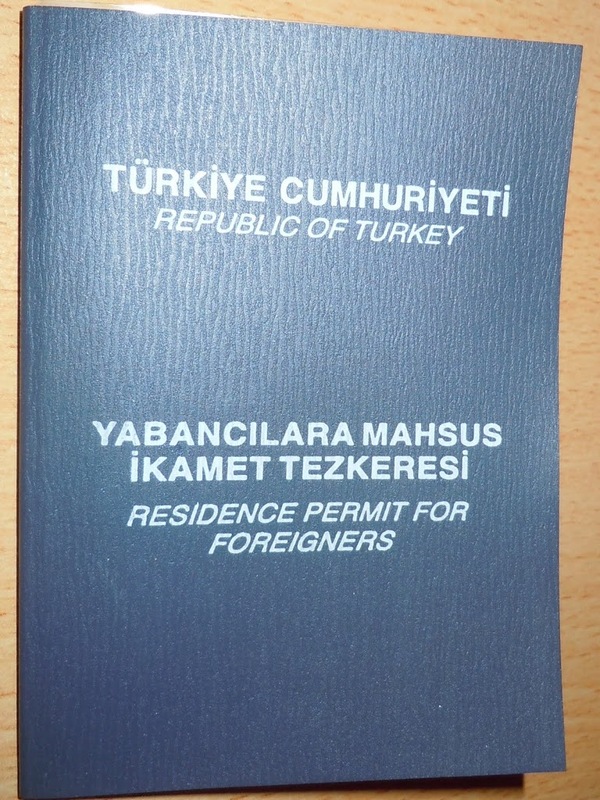 Thankfully, my employers take care of all the paperwork required for my residency permit. The only thing I have to do is sign on a few dotted lines and go to the police station a few times. If I actually had to set up my own appointments at the police station and figure out all of the paperwork and fees on my own, I’d be at an utter loss and, like many ESL teachers in many countries, would be making border runs every three months to get another entry stamp. Even though the paperwork has all been taken care of, I still have to go through the process of applying for the permit and procuring it. Whenever you pack up and move to a new country, you cast yourself to the winds. Jump into a swift moving river. Fight all you want, get upset about lots of little things, but you won’t change anything or make things work better. All you’ll do is get worked up over things that you can’t change. Laughter is the best remedy for it all. I don’t know what’s going on, I don’t understand what’s going on, it all is rather unpleasant for me, but it all makes for a pretty funny story. Since my employers took care of filling out the paperwork and setting up my appointment at the police station, all I had to do was go to the police station with my paperwork to apply for the permit, and a week later, return to pick it up. Step one for me was getting passport photos – four for the residency permit, another half dozen for some other official documents, a handful for something else, another for my teacher ID card… I need passport photos for everything. One day after class I knew I needed them for the next day. But I was horribly ill and almost passed out on the metro, and had to get out two stops early to lie down in the station. But I needed those passport photos, and was out, so despite how miserable I was, I knew that I should really get those photos right then. In a haze, I found a photo place near Istiklal, got my photos and focused on not passing out before I limped my way to my apartment. I have an intense, somewhat crazed look in my photos. The next step was going to the police station for my appointment. I switched teaching schedules with another teacher who would cover my morning classes while I went to the station. The school sent their driver in with me who takes care of talking to the police and knows the process. I was just along for the ride. The main police station is in a glorious 1960s architectural style. If I were in Eastern Europe I would call it 60s socialist style architecture, but I’m not quite sure what the Turkish equivalent is. Next to the sign at the top of the building where it says police station is Ataturk’s signature. I laugh about the cars that have Ataturk’s signature next to the model name. The Ataturk signature edition or something. The police station has Atuturk’s stamp of approval as well. We walked past assault rifle wielding guards, through some metal detectors and past ID checkers, up a few flights of stairs, went to the immigration office, and sat in the waiting room next to a huge fishtank. 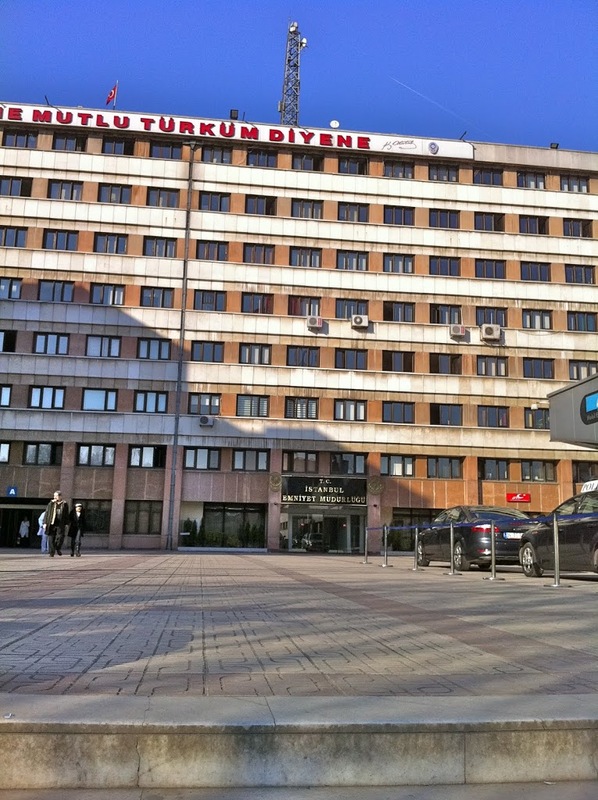 As we waited for my number to be called to one of the thirty or so tables, I gazed at the fish in the tank and wondered why they were here in the immigration office of the main police station in Istanbul, an immense, impersonal, and fantastically bland building. Finally my number was called to table 21. We weaved through swarms of other poor saps who didn’t know what was going on, and I realized that everyone had their own assistant with them; nobody was taking care of it on their own, they all had a Turkish speaker who spoke with the police and explained to them what to do. As my driver spoke with the policewoman behind the glass I looked at what the others in the office were doing. One guy was just turning pages in a book, stamping each page. There was a table with about four people with huge stacks of residency permit files, and they entered the paperwork data into the computer one by one. Many people just stood about. After I signed a few pages we had to run downstairs to another table, where we had to pay them for the permit I think. They gave us a receipt, and then we took the receipt to a third table to get it stamped, and then we had to go back upstairs to table 21 to show them the receipt, pay another fee for something else, and all would be well. But the woman who had been helping us was no longer there. Everyone else was still at their desks helping other people, there were still men standing around eating simits, but for some reason table 21 was empty. After standing around for fifteen minutes, the woman at table 20 finished the paperwork and we could leave. Everything had gone very smoothly, no snags, no troubles, and it took less than an hour. A week later I had to go back to the station to pick it up. This time it wasn’t just me going along to the station. One other teacher would be going along with me to do step one of the process. We went on a Friday, the day before Republic day, so school was only a half day. But the other teacher and I only teach a few lessons in the afternoon on Friday anyway, so we had no lessons at all. His appointment at the station was number one, though, so we had to be at the station at 8:30am, and we met at the school for the driver at 7:30. Some day off, we still had to get up at the same time we do for our 8am lessons. But it was a beautiful clear morning, and the sun was rising as we drove to the station. It reminded me of a line in Pamuk’s memoir Istanbul: Life can’t be all that bad, I’d think from time to time. Whatever happens, I can always take a walk along the Bosphorus. I live a ways from where it’s nice to walk along the Bosphorus and don’t have a car, so it’s not an easy thing for me to go for a walk along the Bosphorus. But I have to get up early for school, and have been enjoying watching the sun rise on the drive to school on clear days. Istanbul is quite beautiful at sunrise and sunset. Last Saturday I couldn’t sleep, so I got up and watched the sunrise at the Galata bridge. On my day off I had to get up early to go to the police station. But things aren’t so bad, I thought. At least I’m watching an Istanbul sunrise. I like trying to figure out where I am in this immense city when I’m on buses or in cars. I knew that the police station was in Fatih, in the old town, but I wasn’t really sure how we managed to get from the school to the old town. I recognized the bridge we drove over was the one right by Eyup, which I’d visited a few weeks ago, which is up the Golden Horn, and is just outside the city walls. We drove through the old city walls, and it amazes me that they’ve been there for the better part of 2000 years. For centuries, nobody made it through them, but now millions of cars drive through them every day. Back in the police station we found ourselves next to the fish tank again. I had to go to a different area to pick up my permit this time, near the fish tank, in a little room that had lots of stacks of paper and little blue residence permits. This step was supposed to be very easy. I just show them my passport, and they give me my card. I showed the guy my passport, and he asked me where my application papers were, to which I replied that they should be here at the police station, probably in the big stack of papers behind his desk. He took my passport and walked around to a few tables, and I trotted along behind him not sure what was really going on and hoping that my passport wouldn’t disappear or something. He explained that I had to go to the table that had processed my application the week before, procure my application papers from there, and bring them back to him. Thankfully I remembered that I had gone to table 20 or 21 the week before. I went to find the driver and the other teacher. They had other problems. This teacher had had to go home a few weeks ago for family concerns. They couldn’t find him in the records for being in Turkey. Our driver didn’t speak much English, and we speak very little Turkish, but we explained in the few words we know that he came back to Turkey on on yedi Ekim, the 17th of October. They couldn’t find him in the system. My paperwork was somewhere in the building but we weren’t sure where, and he wasn’t in Turkey. Apparently when he flew in and got his entry stamp, they had forgotten to enter him into the system for arrivals. We would have to go to the airport to settle it there. We then set about trying to figure out where my papers were. The driver took my passport and talked to some guys at table fourteen. They seemed a bit miffed that they had to deal with this issue that wasn’t their problem and shrugged their shoulders. We then went back to the other room where I had started, and the policeman explained something else to the driver. Back to table fourteen, a few more words there, then the police took my passport around the corner to look me up in the computer. More grumbling, shoulder shrugging, and reluctance of having to deal with this issue. I tried to listen for words I knew, which at this point are words like numbers, months, umbrella or table. I heard yedi bir, or twenty one. We then went back to the other room and told him I had been at table 21. He then dug through the stack of papers and pulled out my file. A lot of trouble for what should have been something fairly simple. We then set off for the airport. The driver wondered if I had a problem accompanying them since I had nothing to do with the problem anymore. Problem yok, I said, there is no problem. I thought it was all very amusing, and wanted to see what was going to happen next. Besides, to take me back and then go to the airport would have taken a long time, and I didn’t want to inconvenience them. This would take long enough already. At the airport, the driver pulled into a no parking area with some taxis and cars that pull over briefly to pick people up. I got up to get out of the car, but the driver told me to stay in the car and if the police come by, to just point to the keys in the ignition and say bir dakika, one minute. Blast! I wanted to see how the story would unfold. So I sat. I got bored after about a half hour and played backgammon on my phone. I won. A a tow truck drove by a few times and looked at me in the window. Another fifteen minutes went by and I got a call saying that they’d be out soon. They finally came back out after around an hour of talking with passport control. Get it all settled? I asked. No. Why not? Well, they took his passport. What? They couldn’t find him in the system (because they hadn’t entered him in the system) and the only proof that he was in the country was the stamp that they had put in his passport when he came in, but which was so smudged nobody could read it. As far as the computers were concerned, he wasn’t standing right in front of them, he wasn’t even in the country! So they needed to take his passport and hold it for a week while they figure out where exactly he is. Maybe give him another stamp or actually enter him into the records this time. But he needed his passport, he explained to them, he’s living in a foreign country and has to have it. No, there won’t be a problem, he can pick it up next week. Well, it’s fine with you lot at the airport, he said, but with the Istanbul police, there is a problem! No, they responded, you just show them this note. They then gave him an 8×11 piece of paper with a handwritten note on it. I believe it explains that while he physically entered the country on the 17th of October, but his information has yet to electronically enter the country. So while the officials make sure that his information enters the system, they are holding his passport at the airport. He’s been cleared to enter the country, but his passport has to wait a week. This isn’t stressful enough as it is, it has to get a little bit more complicated. Bayram begins next week Friday, and we have a week off. He has booked tickets back home for the week to be with his family, and leaves on Saturday. He can pick up his passport on Friday, insha’Allah. The writing topic this week for my students was about laughter. They had to write a paragraph about what kinds of situations make them laugh in different ways. I gave them a sample about evil laughter, and that I laugh evilly when I grade student’s drafts and when people make mistakes in English. I’m not sure what kind of laughter I have about these kinds of stories though. People get mad and frustrated about these things, and I complain too, but at the same time I know it’s all very funny. It is with laughter through tears, to paraphrase a line from Meša Selimović’s The Fortress, that we are best able to understand people and the way the world works.